Toilet models that use the Sloan Flushmate System will sometimes make a moaning or groaning noise when flushed. Other times they continuously gurgle, like the sound of water leaking or bubbling. The groaning noise occurs just AFTER the toilet has flushed, while the tank is refilling. The gurgling noise is continuous. A somewhat loud whooshing noise is normal when this type of toilet is flushed, this sounds similar to the noise a commercial toilet makes. Here's how to fix it. The objectionable noise from the Flushmate device sounds something like an old-style foghorn, a loud groan, or vibration (it is cause by vibration, so that makes sense!) Some people may find that it sounds like a ghost, cow, or some other animal. Often it is a two-toned noise with a high pitch at first and then a lower pitch after. I think it sounds like the fog horn on that old soap commercial that went "Bee...- Ohhh..." Now I'm dating myself, since that commercial hasn't been around for many, many years! Fortunately both these problems are very easy to cure. The same fix works for both. 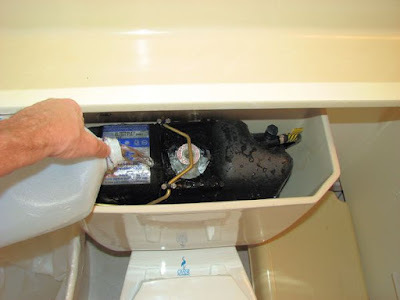 Remove the ceramic cover from the tank on the back of the toilet. Fill a one-gallon jug with water. Pour the water into the toilet tank. Just pour it over the top of the black plastic Flushmate container. It will run down the sides into the bottom of the ceramic tank. See photo below. Now flush the toilet. The noise should be gone. Pour 1-gallon of water into the tank, then flush the toilet. If this does not fix the problem there is a separate issue regarding Flushmate toilets made prior to the year 2000. The noise these older toilets make is at the start of the flush cycle and is due to a defect or misadjustment. At one time there were instructions for fixing that problem on Sloan's website but they appear to have been removed at the last time I checked. You will need to contact Sloan for assistance, see Sloan's website for contact information. To prevent condensation from filling up the ceramic tank there is a water release valve at the bottom of the ceramic tank, under the black Flushmate unit. Sometimes this valve becomes stuck, which results in the noise that you were hearing. Pouring water into the tank causes the valve to unstick. Sloan Flushmate systems are used in toilets made by the following companies: American Standard, Capizzi, Crane, Ellipse, Eljer, Gerber, HCG, Kohler, Lamosa, Mancesa, Mansfield, Orion, Peerless Pottery, Vitra, Vitromex, Vortens, Western, Xinqi. My Flushmate shown in the photo eventually began to gurgle daily, indicating need for repair. My wife was never happy with this Crane toilet, it's very loud when flushed and didn't clear the toilet contents very well when flushed. So rather than bother to repair a toilet she didn't like, I replaced it with an American Standard Cadet 3 model with a 3" flush valve. The new toilet is now several years old and working great. It clears better and is much quieter than the Flushmate.